With the authorisation of an increasing number of biosimilars, and the prospect of multiple biosimilar switching, biosimilar naming and the importance of this for pharmacovigilance are coming into sharper focus. Current naming policies are not universal; neither are extrapolation criteria. Indeed, consideration of whether we can extrapolate information from one indication or disease to another continues to be a divisive topic. However, this is changing, as we strive for a more harmonised approach. Such a unified approach will be needed when considering future strategies to follow for multiple biosimilar switching, especially so because there is currently no uniform policy regarding interchangeability, switching, and automatic substitution. In this multiple biosimilar setting, the question as to whether we can be confident to move across indications will be increasingly important. The cost of biosimilar switching also needs to be considered—biosimilar use may mean that patients need more training and medical visits, with associated administrative costs. The biosimilars debate seems to be refocusing issues that have previously been extensively discussed but that have recently lost impetus, including the role of clinical pharmacology in internal medicine. Biosimilar naming to allow biosimilars to be clearly distinguished from their reference product is important to allow physicians to prescribe the intended biological medicine; it is also crucial for reporting adverse effects that may be observed for both the original and biosimilar drugs. Furthermore, giving the intended biological medicine to the patient at the pharmacy level needs to be ensured. There is a debate about naming: the first idea is to have distinct, non-proprietary names,3 in which it is acknowledged that the biosimilar is similar but not identical to the innovator. This ensures prescription of the correct medicine and facilitates biosimilar tracking. The second idea is to use identical non-proprietary names for both biosimilar and reference product. Here, identification of the pharmaceutical product is by its active pharmaceutical ingredient.4 There are several possible types of identifier, such as brand and batch number, which can be used to identify and track post-manufacturing changes and to enable determination of whether different biosimilars are being made. However, it is remarkable that we do not have a clear perception about the impact of manufacturing changes on the safety and efficacy of original drugs in order to understand whether different original drugs have been manufactured during their cycle. Therefore, a clear opportunity now exists with the biosimilars to implement an efficient pharmacovigilance system that can assess the impact of biologics manufacturing on the efficacy and safety of drugs. 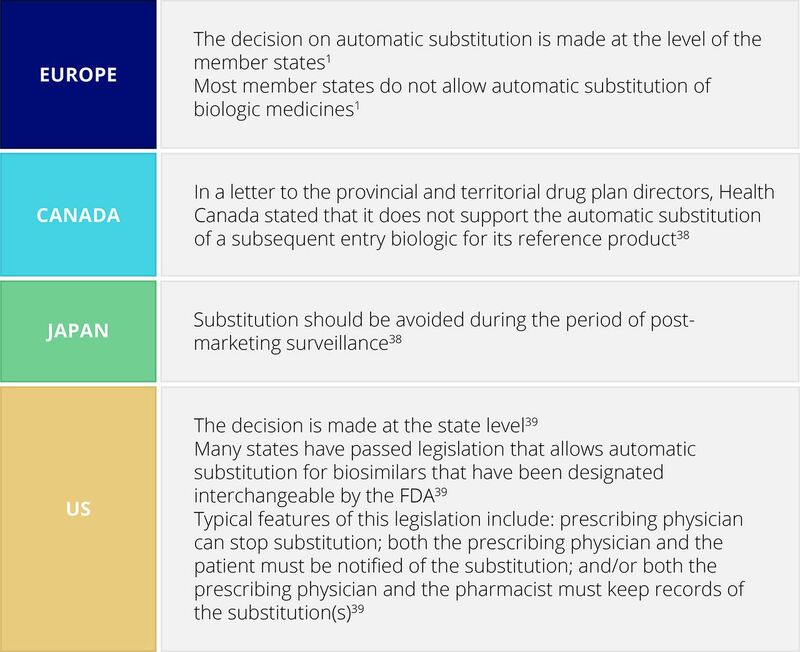 Policies differ between agencies (table 1).5 In Europe, biosimilars are authorised by the European Medicines Agency (EMA) and interchangeability is authorised by individual member states. In Europe, there is a ‘prescription by brand’ policy to distinguish the actual product given to patients and enable pharmacovigilance.3 For example, for etanercept, the innovator is Enbrel and the biosimilar Benepali. However, for both biosimilar and innovator, the same international non-proprietary name (INN)—etanercept—is used. In 2015 the US Food and Drug Administration (FDA) finalised a formal naming policy in which a ‘family name’ identifies the biosimilar; however, interchangeability requires additional information, so a four letter suffix strategy is applied.6 For example, Zarxio, the first biosimilar licensed in the US, and the only biosimilar commercialised, was given the name filgrastim-sndz. Other examples are shown in table 1. The World Health Organization (WHO) is trying to harmonise the naming of biosimilars to prevent an escalation in the number of different national naming systems.8 As with FDA policy, the WHO proposes a biological qualifier be added to the name of the product, the purpose of which is to complement the INN by adding a unique four letter code that identifies the manufacturer of the active substance. It proposes that this be applied to all biological products—innovators and biosimilars. However, this is not a mandatory policy and so relies on voluntary participation by individual countries; currently, there is no agreement between them. For biosimilar approval, clinical equivalence studies are required. These are to demonstrate that the biosimilar’s efficacy is within a pre-established range of the innovator. However, there is no uniformity with respect to the strategies to determine equivalence for anti-tumour necrosis factor (TNF) agents. The consequences for indication extrapolation of having different equivalence ranges for anti-TNF agents is currently unknown. For biosimilars, a complete dossier of Chemistry, Manufacturing and Control information exists, containing extensive information about the quality, characteristics of the products, pharmacological data in all mechanisms of action, and information regarding clinical studies in a specific indication. From this indication, it may be possible to extrapolate to other indications/diseases.19 However, to be able to do this, clinical studies should be performed in a sensitive population. The difference between a sensitive and poorly sensitive population adapted from Castañeda-Hernández, 2015. We can illustrate this using the example of trastuzumab in the treatment of breast cancer. 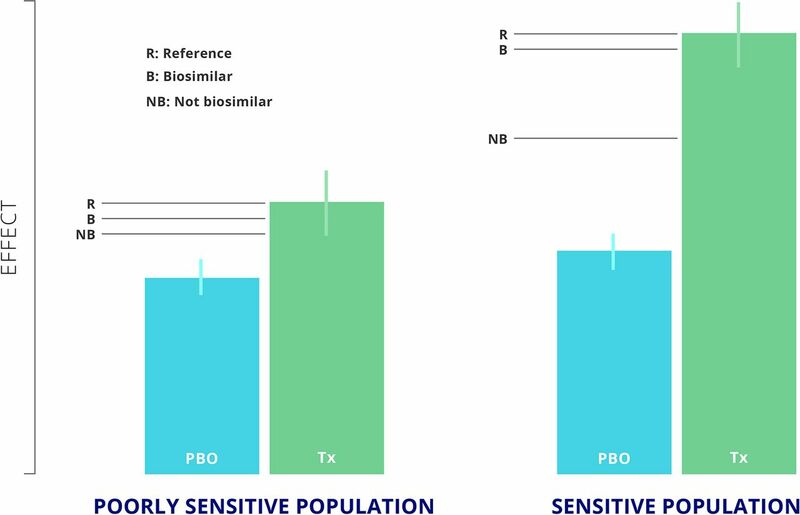 Jackish et al suggest that the neo-adjuvant/adjuvant population is a homogeneous and sensitive population to establish similarity for a trastuzumab biosimilar candidate.21 However, a different approach has been taken by Mylan, a biopharmaceutical company that performed a clinical study in the metastatic population and submitted the results to the FDA.22 It remains to be seen whether the FDA will accept the results from this more heterogenous population. For anti-TNF agents in inflammatory diseases, it is not clear which is the most sensitive indication from rheumatoid arthritis, Crohn’s disease, and psoriasis. Moreover, for patients with rheumatoid arthritis, it is also not clear which are the most sensitive populations, whether methotrexate-naïve patients, patients with an insufficient response to methotrexate, or those with insufficient response to other biological agents. Some of the authors of this article consider that extrapolation should be approached cautiously. Most clinical equivalence studies have been performed in rheumatological indications. However, the pivotal clinical study for GP2015 was performed in patients with psoriasis, and there is concern about using psoriasis (rather than psoriatic arthritis) to extrapolate use of GP2015 to rheumatoid arthritis. However, there has been substantial uptake of CT-P13 in IBD, and this could be considered an example of clinical practice confirming that indication extrapolation works. However, it should be noted that CT-P13 was tested in ankylosing spondylitis, a disease in which many patients have IBD, and we would be more reluctant to prescribe for rheumatoid arthritis a drug that has been tested in psoriasis but not in rheumatoid arthritis. Therefore, there is an argument for considering extrapolation on a case-by-case basis. We acknowledge that when discussing extrapolation, there is a need to consider not only what the drug does to the disease (and the potential influence of immunogenicity on pharmacokinetics) but also what the disease does to the drug. Drug responsiveness may vary between diseases, even though drug mechanism may remain the same. Thus, the biosimilars debate seems to be refocusing issues that we should have been considering for many years, including the need to respect the prominence of clinical pharmacology in internal medicine. Therefore, we have two options: to perform clinical studies for each discipline or to ask the regulatory agencies to communicate not only with guidelines but also by explaining their decisions in terms of drug pharmacology to allow the clinician to make an informed decision. It would be helpful if representatives of the different specialties involved in using biologics and biosimilars could come together to further consider these questions and to exchange experiences and concerns. Interchangeability, switching, and automatic substitution, although similar concepts, are not identical. 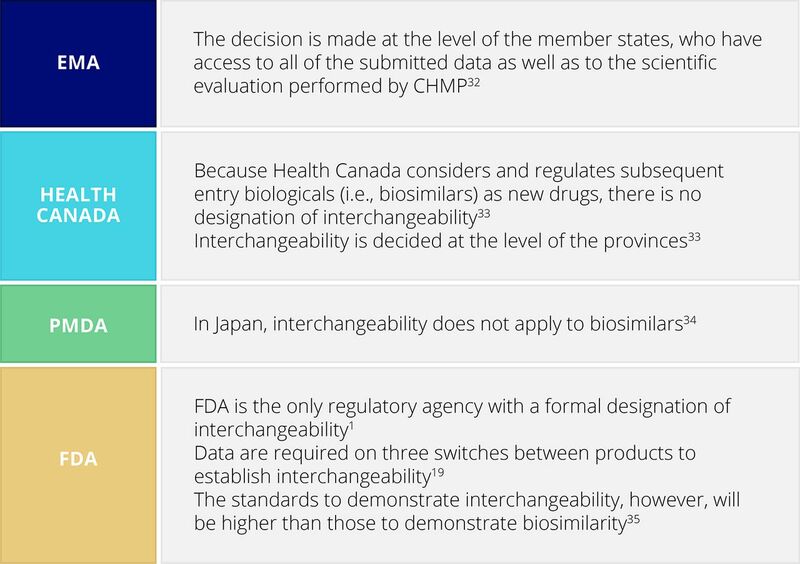 Interchangeability designation – heterogeneity of regulatory guidelines. Medical switching is a physician’s decision to exchange one medication for another, usually to optimise treatment or to minimise adverse events.29 36 37 The substitute agent is typically, though not always, introduced after the first agent has failed, with patients switched to a substitute agent usually remaining on that agent. In contrast, non-medical switching, in which a substitute agent is typically introduced in stable patients, is driven by economic reasons and may be enforced through guidelines and/or legislation. Therefore, a prescribing physician may not be a part of the non-medical switching decision.37 Efficacy, safety, or convenience benefits are not expected. Clear naming strategies and traceability are needed for biosimilars. It is important to follow when the switch was performed and how it was performed. The prospect of multiple biosimilar switching further highlights the need for biosimilar naming policies that facilitate pharmacovigilance. Extrapolation criteria are not universal. However, these are evolving towards harmonisation, and we hope that this will soon be achieved. In addition, criteria for interchangeability and automatic substitution are currently not universal. The question of whether we can confidently move across indications or diseases will become increasingly important when we enter the world of multi-biosimilars and multiple biosimilar switching. For example, in just a few months switching may occur between innovator etanercept and two or more biosimilars, as two biosimilars are already authorised by the main regulatory agencies. We do not yet have any clear criteria for multiple biosimilar switching. So, what strategy should we follow, especially when dealing with extrapolated indications? We should not be afraid of biosimilars, although the same is not the case for intended copies. By relating data clearly to clinicians, manufacturers and regulators will be possible to offer them if not certainty then at least confidence in the use of biosimilars.
. Biosimilars: considerations for clinical practice. Cons in Med Fortcom.
. Biosimilar by name and biosimilar by nature. 2013 http://docplayer.net/21270809-Biosimilar-by-name-and-biosimilar-by-nature.html.
. Global regulatory landscape of biosimilars: emerging and established market perspectives. Biosimilars 2015;5:19–32. US Department of Health and Human Services. Nonproprietary naming of biological products: guidance for industry. 2017 https://www.fda.gov/downloads/drugs/guidances/ucm459987.pdf.
. RAPS. Australian regulator hits restart on plan to name biosimilars. 2015 http://raps.org/Regulatory-Focus/News/2015/01/21/21131/Australian-Regulator-Hits-Restart-on-Plan-to-Name-Biosimilars/. World Health Organization. Biological qualifier: an INN proposal. 2015 http://www.who.int/medicines/services/inn/bq_innproposal201506.pdf.pdf. EuropaBio. EuropaBio position paper on biosimilars in Europe. http://www.lif.dk/SiteCollectionDocuments/Publikationer/europabio_biosimilars_position_paper_final.pdf.
. IfPA policy brief calls for transparent biosimilar labeling. 2015 http://allianceforpatientaccess.org/ifpa-policy-brief-calls-transparent-biosimilar-labeling/. Generics and Biosimilars Initiative. Call for action on labelling of biosimilars. 2014 http://www.gabionline.net/index.php/Biosimilars/General/Call-for-action-on-labelling-of-biosimilars. European Medicines Agency. Annex I: summary of product characteristics for Remicade. http://www.ema.europa.eu/docs/en_GB/document_library/EPAR_-_Product_Information/human/000240/WC500050888.pdf. European Medicines Agency. Annex I: summary of product characteristics for Remsima. http://www.ema.europa.eu/docs/en_GB/document_library/EPAR_-_Product_Information/human/002576/WC500150871.pdf. Food and Drug Administration. BLA 761024: ABP 501, a proposed biosimilar to Humira (adalimumab). 2016 https://www.fda.gov/downloads/AdvisoryCommittees/CommitteesMeetingMaterials/Drugs/ArthritisAdvisoryCommittee/UCM510293.pdf. European Medicines Agency. Concept paper on extrapolation of efficacy and safety in medicine development. 2013 http://www.ema.europa.eu/docs/en_GB/document_library/Scientific_guideline/2013/04/WC500142358.pdf. US Department of Health and Human Services. Scientific considerations in demonstrating biosimilarity to a reference product: guidance for industry. 2015 https://www.fda.gov/downloads/drugs/guidances/ucm291128.pdf. Biosimilar News. FDA accepts Mylan and Biocon’s proposed trastuzumab biosimilar application. 2017 http://www.biosimilarnews.com/fda-accepts-mylan-and-biocons-proposed-trastuzumab-biosimilar-application. .Assessment report: Remsima - 27 June 2013. 2013 http://www.ema.europa.eu/docs/en_GB/document_library/EPAR_Public_assessment_report/human/002576/WC500151486.pdf. Celltrion CT-P13 (infliximab biosimilar). Briefing document for the Arthritis Advisory Committee. 2016 https://www.fda.gov/downloads/advisorycommittees/committeesmeetingmaterials/drugs/arthritisadvisorycommittee/ucm484860.pdf. Generics and Biosimilars Initiative. Health Canada approves inflectra biosimilar for extra indications: pro pharma communications international. 2016 http://www.gabionline.net/Biosimilars/News/Health-Canada-approves-Inflectra-biosimilar-for-extra-indications. Generics and Biosimilars Initiative. Glossary of key terms. 2017 http://www.gabionline.net/Biosimilars/General/Glossary-of-key-terms. US Food and Drug Administration. Information for consumers (biosimilars). 2015 https://www.fda.gov/drugs/developmentapprovalprocess/howdrugsaredevelopedandapproved/approvalapplications/therapeuticbiologicapplications/biosimilars/ucm241718.htm. US Food and Drug Administration. Considerations in demonstrating interchangeability with a reference product: guidance for industry. 2017 https://www.fda.gov/ucm/groups/fdagov-public/@fdagov-drugs-gen/documents/document/ucm537135.pdf. Alliance for Safe Biologic Medicines. Frequently asked questions. https://safebiologics.org/faqs/. US Food and Drug Administration. Guidance for industry on biosimilars: Q & As regarding implementation of the BPCI Act of 2009: Background.. 2016 https://www.fda.gov/Drugs/GuidanceComplianceRegulatoryInformation/Guidances/ucm259806.htm. European Commission. What you need to know about biosimilar medicinal products. 2013 http://www.medicinesforeurope.com/wp-content/uploads/2016/03/biosimilars_report_en.pdf. Amgen Inc. The use of biosimilars. 2017 http://www.amgenbiosimilars.com/the-basics/the-use-of-biosimilars/.
. Patient safety and comfort: the challenges of switching medicines. 2010 http://www.patients-rights.org/uploadimages/Patient_Safety_and_Comfort_The_Challenges_of_Switching.pdf.
. Biosimilar regulation: important considerations and global developments. Life Sciences Handbook 2011. Practical Law Company 2011 https://www.cov.com/~/media/files/corporate/publications/2011/01/biosimilar-regulation-important-considerations-and-global-developments-2011.pdf.
. State laws and legislation related to biologic medications and substitution of biosimilars. 2017 http://www.ncsl.org/research/health/state-laws-and-legislation-related-to-biologic-medications-and-substitution-of-biosimilars.aspx.
. OP0225 Three months' clinical outcomes from a nationwide non-medical switch from originator to biosimilar infliximab in patients with inflammatory arthritis: results from the Danbio Registry. Ann Rheum Dis 2016:75–142.
. EU clinical trials register. https://www.clinicaltrialsregister.eu/ctr-search/trial/2014-002056-40/NO.